What surprised you the most about Cambodia? When I first came to Cambodia I was surprised by how supportive the Phnom Penh community is. I wasn’t sure what it would be like living in a new city in a country I didn’t grow up in, but here everyone truly lives by, “ask and you shall receive.” This goes for the expatriate community and the local Cambodians alike. If you need a job, a recommendation, or a place to sleep, all you have to do is ask. The biggest challenge I found was the learning curve. It takes time to learn a new city’s street names and locations so you don’t get lost on the way to interviews. It takes time talking to fellow reporters and learning that you should always ask for the day a person was born to find out their age because in Cambodia some people calculate their age from the date of conception or say they’re actually a year or two younger because they were held back in school. Every experience helps you adapt but going into each one not knowing the lay of the land can be a challenge. I am especially proud of an article I wrote about psychologists and mental health services in Cambodia. It took weeks of reporting, research, and multiple follow up calls but it eventually came together. 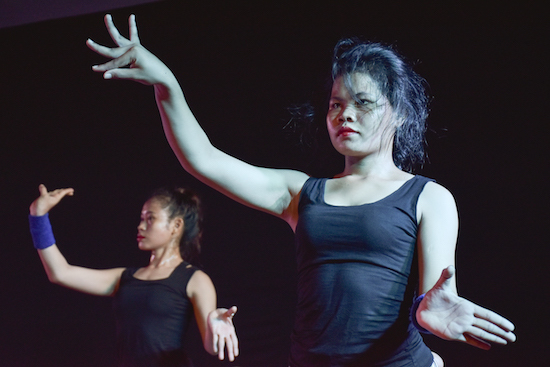 I am interested in art therapy so when I came to Phnom Penh I emailed a bunch of different psychological services organizations to see if there was anyone in the city using art therapy. I found an organization that ran art therapy sessions and through speaking with one of its lovely founders, I uncovered this story. I don’t have many sources here and a lot of the time other reporters or editors kick stories over to me so I am also proud I found this story all on my own. I ride my bike everywhere now. Through the blazing sun, the monsoons, and the frantic, flowing traffic. And the best part is it is one of my favorite parts of my day. The first two weeks I owned a bike I was honestly too chicken to use it. I walked everywhere because I didn’t want to deal with the stress of the insane traffic. Then I ripped off the Band-Aid and tried it. Now I feel at one with the city when I just stay alert and move gracefully with all the other motorcycles weaving between the cars. I also speak a little Khmer! (this is the language Cambodians speak.) I started as soon as I got here after I met a woman who would become my closest Cambodian friend. Every Khmer person is impressed when I can introduce myself or give directions to my tuktuk (motorcycle taxi) driver. I found a place near my apartment to buy local produce! It took perhaps a month but I found a street where stalls line the sides and people sell fruits, eggs, and veggies (basically all I eat). The other options for produce are large supermarkets or marketplaces that close at 5pm. It’s nice to not support large supermarkets and instead support local farmers and sellers. I get off too late from work to go to the local marketplaces that are a bit far from my apartment. Now I just swing by this street on the bike ride home from work. I keep going back to the same people so they know me and throw extra goodies like lychee fruit and green onion into my bag. 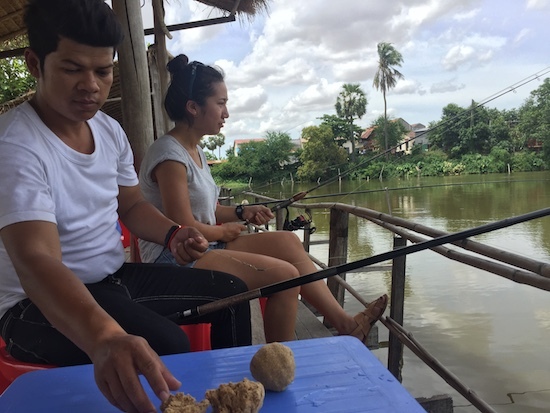 One weekend my roommate (a 21-year-old Singaporean Japanese girl who is interning as a grant writer at an NGO here) and I went fishing with these two guys whom she had met through her the AirBNB she stayed in her first week here. The four of us took a tuktuk 30 minutes out of Phnom Penh to a lake where koi fish live. The lake has become a local fishing spot. People sit with their rods in hand on wooden decks that line the perimeter of the lake. There’s even a tiny restaurant you can order from. Many families gather and sit on mats on the deck floor with beers in hand and babies in their laps. We spent around five hours fishing, talking to each other about our jobs and our homelands. The bait we used was wet dough you mold into a ball on the hook. So eventually the water would disintegrate the dough and you would have to reel in the hook and mold a new one. We asked the boys if they had ever caught anything and they assured us they had. Not every day they came but every other, at least! We left the lake around 5pm without any catches. While we were preparing to leave my roommate who speaks Chinese overheard the group next to us say to each other, thinking no one else would understand, “It’s too bad those girls didn’t go fishing with people who knew how to fish, then they might have caught something for dinner.” My roommate and I had a good laugh when she told me because the two guys we went with prided themselves on dedicating most of their weekends to perfecting their fishing skills. I couldn’t think of a better opportunity than this internship to conclude my degree. I wish everyone could have this opportunity because the amount of ownership you have over your life when you move to a new, foreign place is incredible. You get to choose everything. What you do, where you spend your time. You orchestrate a new life and the empowerment you get from it helps you grow. Nothing is stagnant, the only constant is change, so why not move to a new place and see where the adventure takes you?